Like the proverbial fish who doesn’t know what water is, we swim in an economy built on money that few of us comprehend, and, most definitely, what we don’t know is hurting us. Very few people realize that the nature of money has changed profoundly over the past three centuries, or—as has been clear with the latest global financial crisis—the extent to which it has become a political instrument used to centralize power, concentrate wealth, and subvert popular government. On top of that, the economic growth imperative inherent in the present global monetary system is a main driver of global warming and other environmental crises. 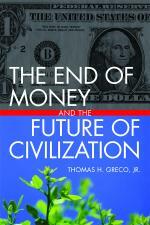 Ultimately, The End of Money and the Future of Civilization provides the necessary understanding— for entrepreneurs, activists, and civic leaders—to implement approaches toward monetary liberation. These approaches would empower communities, preserve democratic institutions, and begin to build economies that are sustainable, democratic, and insulated from the financial crises that plague the dominant monetary system. About the Author Thomas Greco, Jr.